The bizarre situation in 1970. Developers bought most of the 1820s houses to build fresh offices, but Miss H. Silvester who had lived at No. 9 for 50 years refused all offers for her property and refused to budge. The new blocks were built either side, and her house shored up. 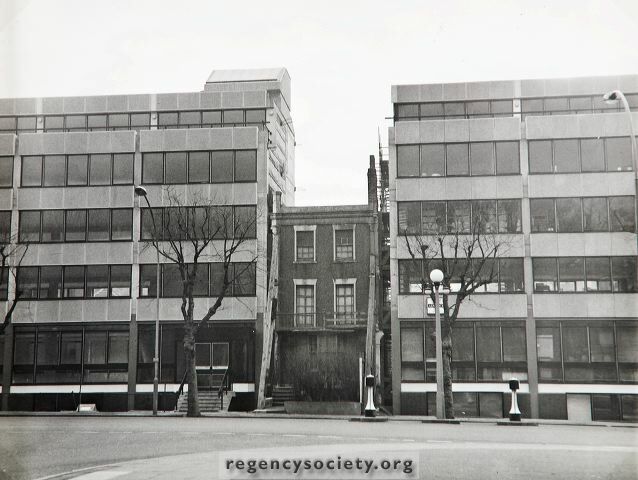 She was in the house when the photograph was taken on 15 February 1970, some years after the offices were built. She died in March 1974, aged 89. Her house was then demolished and the offices linked up.